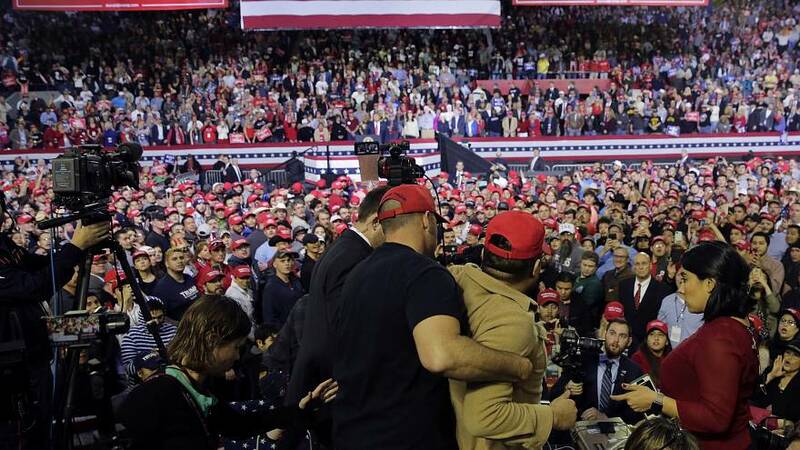 A man attending President Donald Trump's rally Monday night in El Paso, Texas, entered the press area and went after journalists, appearing to shove multiple people and cameras before being escorted out of the venue. "F--k the media," the man, who was not immediately identified, could be heard shouting in footage from the incident. BBC cameraman Ron Skeans was among those attacked. A BBC spokesman said in a statement that Skeans "was violently pushed and shoved by a member of the crowd while covering a President Trump rally in Texas last night." As is the case at many Trump rallies, the president did take time out of his speech to criticize the media and what he deems "fake news."